Last year 7/7/07 marked the 30th anniversary of The Spy Who Loved Me. Almost 31 years later, the Swiss company Rinspeed has built a Lotus Elise that is fully submersible dubbed the sQuba. The sQuba is an all-electric vehicle with three motors, one to drive the car on land and two to power a pair of screw drives for underwater movement. 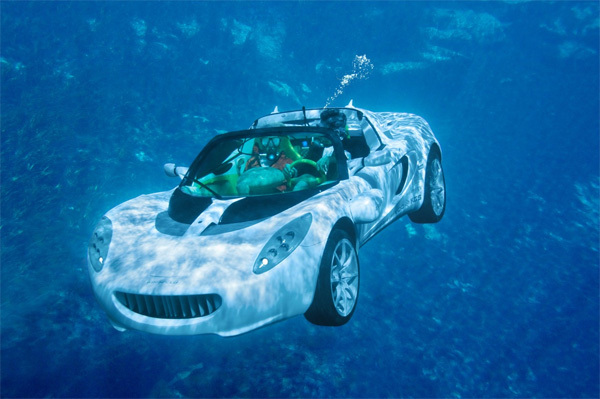 These are aided by two Seabob jet drives that “breathe” through rotating louvers mounted on the car’s fenders and appear to give the car its maneuverability underwater. Read more including more images and a video here. Jun.21.07 » Probably not "True Bond"